Happy April Fools' Day! :). I can't believe it's April already - can you? And I also cannot believe how blessed I am, as so many new readers have chosen to follow my blog and my Instagram shares - thank you soooo much for your kindness and support! We have the pleasure this week of joining the Spectrum Noir team “Making Art” with great coloring tools and our stamps. And no, it's not an April Fools' Day trick - it's for real! lol. Spectrum Noir is a range of professional coloring tools. The range includes alcohol markers, blendable colored pencils, inks, Spectrum Aqua watercolor markers, and marker storage. I hope you will join us this week for fantastic inspirational projects, ideas and amazing prizes! Hang on, did someone say prizes...??? Of course there are prizes!! 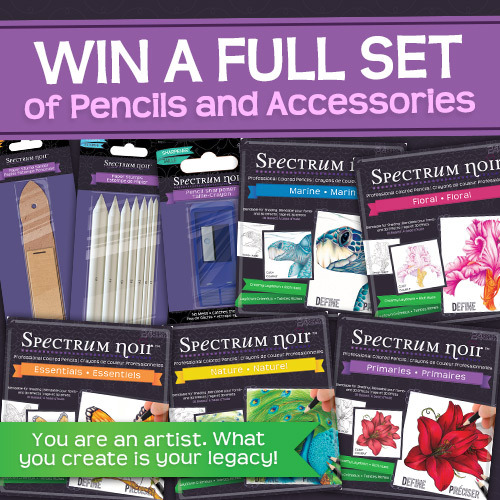 First, we’ll be giving away a full set of Spectrum Noir Pencils plus accessories to one participant who completes our Rafflecopter giveaway. Click on the Stampendous blog link below to enter! Amazing, isn't it! I wish I could enter myself - I certainly wouldn't mind adding these fab pencils to my collection! And, of course, we always like to invite you to comment on our Design Team Blogs, so we’ll be offering three prize packages consisting of House-Mouse Designs®Painting Pals, Painted Posies and Making Prints Cling Rubber Stamps by Stampendous PLUS a $30/£30 gift certificate to the Spectrum Noir website. This is open even to our international friends!! And here is my offering for today - a colourful pastel butterfly card :). I wanted to see if I could make my own arty-ish background using the markers. I started by liberally drawing horizontal and vertical lines with the chisel tips of the markers on a piece of Mixed Media Paper. I was trying to very the thickness of the lines to create almost a plaid-like effect. I also drew through a DIY stencil with circles in varying sizes which I die cut on a sheet of acetate. I added some black and white paint splatters, and also some stamping with the Script and Kaffee Klatsch stamps. Some of the 'doily' images were also heat embossed in white. 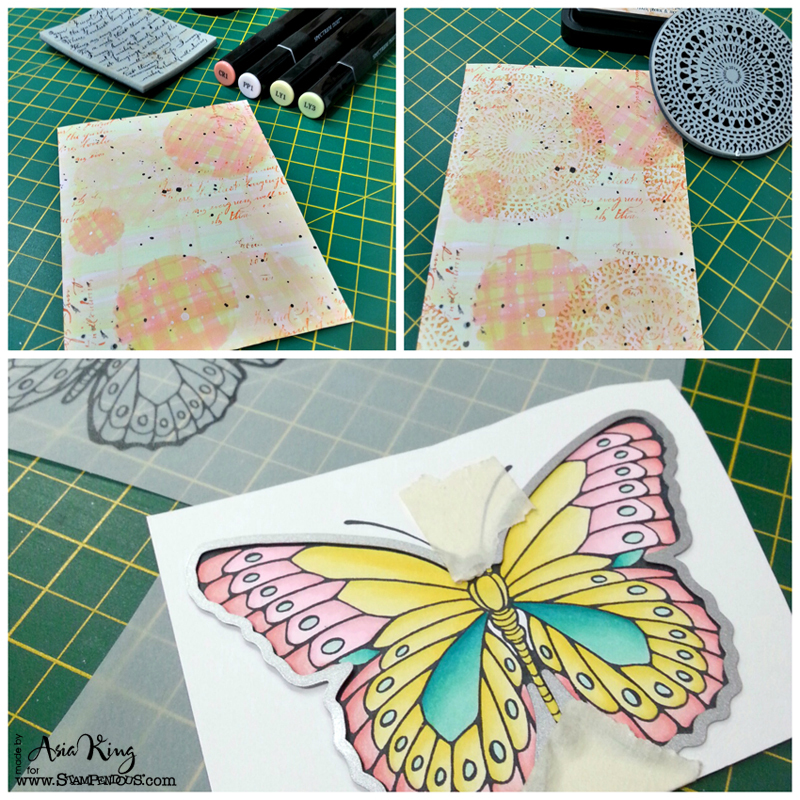 After stamping a colouring two butterflies, one on the Mixed Media Paper and one on white vellum, I die cut them using the Butterflies Die Set, which made it super quick and easy (rather than heaving to fussy cut them). Other: Memento Tuxedo Black ink, Liquid Perals, self adhesive pearls, BazzillBasicsPaper Doilies (Ambrosia collection), DCWV Mariposa, cardstock, decorative fibers. Thank you for stopping by and all your wonderful comments. Good luck in the draw and I'll see you again on Friday! Absolutely beautiful! I love the butterfly and the colors you chose. Great card! My goodness I'm drooling over this beauty ... I adore the colours and the whole card is stunning!! Absolutely beautiful. The colors are unique and stiking. The background is inspirational. This is one of my fav cards ever!! Thanks for the inspiration and sharing!!! Wow, so many gorgeous details to look at on this card. It is so beautiful. First, love, love the background. And your coloring on the butterfly is awesome. Then all the extra embellishments to your card just make it WOW. Thanks for the inspiration. You've hit a home run with us crafters Asia - that is one really beautifully stamped and coloured image - I am drooling over your beautiful project! Gorgeous card, love the soft colours and beautiful butterfly. Amazing and beautiful card. 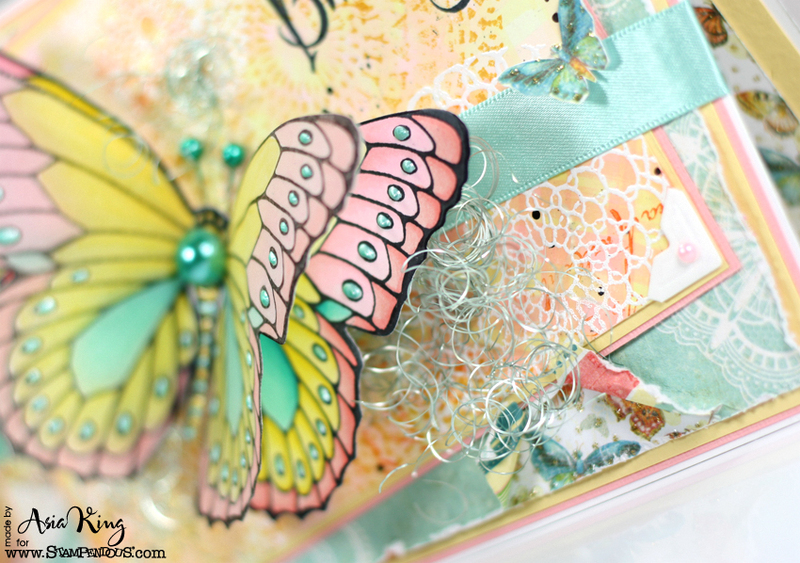 There is just gorgeous layers of texture in that handmade background paper and the butterfly is WOW! Thank you for sharing your creativity with us! 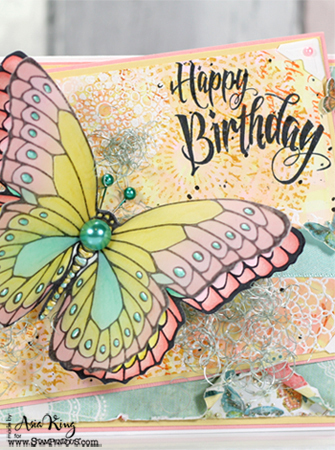 stunning card Asia the butterfly and coloring is gorgeous! This has left me speechless! I am sitting here with my jaw on the floor, eyes bugging out of my head and just oohing and aahing over this beautiful creation! I absolutely love everything about it and just can't stop looking at it! I am going to save the picture and use it as my desktop background. That way I can see it first thing every morning and gape at it in awe! You are so talented and I love seeing your creations! TFS! What a beautiful card, with GREAT background, you created ! Really inspiring. A lot of beautiful details to discover, that makes it to a little piece of art ! Oh my gracious I am in love with your card. I love butterflies but what you have done is so beautiful. I am new to Spectrum Noir so I wanted to learn more about them I have just the set of Orange to try them out but my stamping list and I have been talking about if it would be good to make the change from the "other" to Spectrum Noir. thank you for sharing with us. 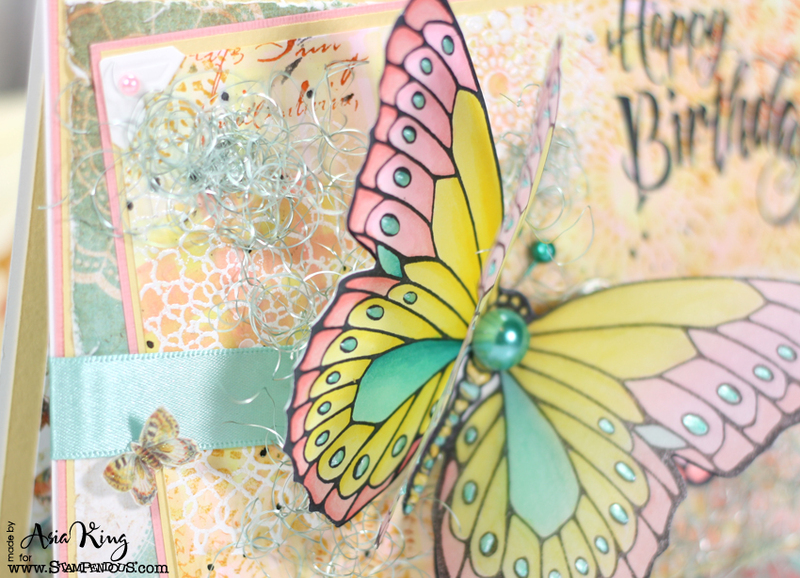 Beautiful butterfly card--love the colors. knew I needed to get more pastels. Your creation is stunning! I love the background that you created for your card. Very clever. the background is beautiful and then you see the butterfly. He is gorgeous. thanks for sharing an amazing card. Stunning use of so many techniques! You really put your heart into this one (as always)! I am new to stamping/coloring, and I'm learning so much from you "pros". Thanks for sharing! How exciting for you to be able to play with the full set. Woohoo for you. Thanks so much for sharing your beautiful card and how you made the background. Pastels are my absolute favorite and this card is the perfect example of why. Stunning card! I love the gorgeous texture and colorful butterfly. Thanks for sharing. Your card is so pretty. I love the butterfly and how you doubled it to give it that in flight look. I am really loving your background and the add of texture right behind the butterfly. Well done. And thank you for sharing. Gorgeous! Love the colors you used. Stunning card! The butterfly is beautiful & I love the the intricacy of the background! LOVE Everything - the coloring, embellishments, design etc. Soooooo P R E T T Y !!! 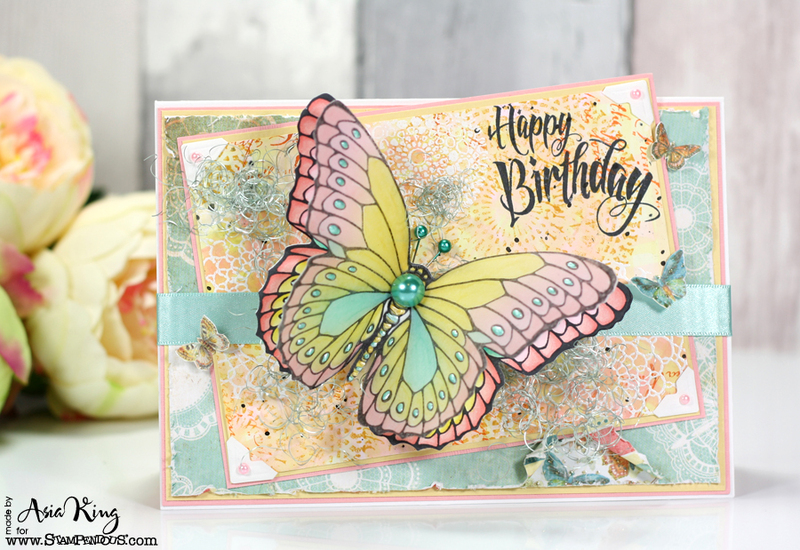 I so love this colourful pastel butterfly card! Such beautiful Spring colors with the Spectrum Noirs. Love that background, too! This has to be one of the best cards I have seen, so beautiful. Gorgeous card. Love how you created the background with the different techniques and products and your butterfly is stunning. LOVE your BEAUTIFUL background and GORGEOUS butterfly - LOVE IT ALL!!! Wow, I just love that stamped panel! And the butterfly is beautiful! Amazing work!! Thanks for sharing. Gorgeous card! That butterfly is beautiful! Thanks for joining along with the Simon Says Stamp Monday challenge! Your card is so beautiful and love your gorgeous details!